I watched Everyday Italian on Sunday morning and made a decision on the spot to make her Rigatoni with Lamb Ragout. It’s been a while since I’d made lamb, and the way she was describing the meal: meaty, hearty, mmm, it just struck me in the right way to entice me to make it. I don’t know. Whatever- I’d just spent nearly an entire week eating nothing but crackers, tea, and the occasional slice of toast, and I wanted some rich pasta dish, and that’s my right. So after the second straight day of wandering around at New York Comicon, I headed home to pick up a few essentials for this meal. I hit an Italian grocery store that hadn’t any ground lamb! and then Waldbaum’s which also had no lamb. BF spotted a lone package of ground veal, though, and insisted we use that. And that’s how this became a different meal entirely. In a medium sized pot, heat a splash of olive oil. Add carrot, celery, half of the onion and about 3 of the cloves of garlic, allowing to soften. Once softened, add the can of crushed tomatoes. Lower the heat and allow to cook for about an hour, or until most of the liquid has cooked off and the result is a very thick marinara sauce. 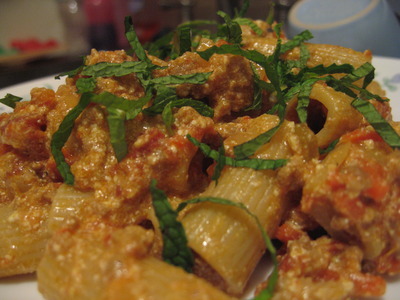 In the meantime, cook rigatoni to al dente or just shy of al dente. In a large frying pan, brown the veal with the rest of the onions and garlic. Once mostly browned, deglaze pan with splash of beef stock or red wine. After that’s cooked off, add all of the sauce and turn off the heat. My pan turned out not to be large enough for the next steps, so I transferred everything to a large serving bowl, but add the rigatoni and ricotta, tossing to coat. Serve hot. Optional: add shreds of fresh basil on top. In the picture, I have mint, actually, because Giada’s recipe used mint to complement the lamb. Don’t use mint unless you have lamb or really, really like mint, because it didn’t really go well with the veal. Then again, I’ve never been much of a fan of mint in my savory dishes. Otherwise, this was a deliciously creamy, meaty and just wonderfully flavorful meal. The carrots added a sweetness to the sauce that couldn’t be achieved with honey or sugar- it was just the right combination of everything. It smelled wonderful while cooking, too. I was very happy and will definitely be making this regularly- the BF loved it as well! hey, cool substitution w/the veal. obviously, mint (jelly) is traditionally served w/lamb, and giada put her own spin on it w/her recipe for ground lamb: which was pretty clever. if you subbed veal, imo, a chiffonade of flat parsley might have proved to be a better garnish with the veal and pasta. check out the rigatoni w/rosemary veal ragout at le zie (20th and 7th). i came across your recipe while searching for something similar to this delicious dish!